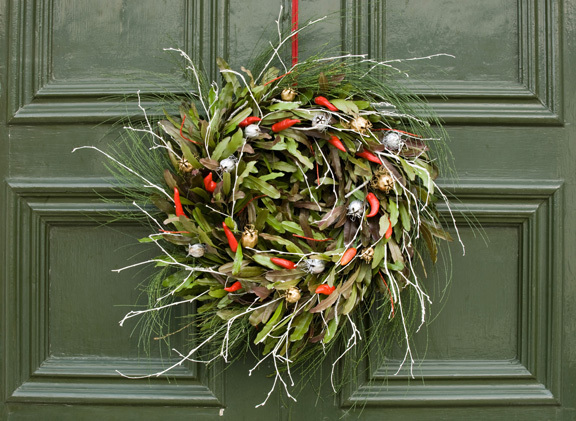 The secret to making a long-lasting and handsome wreath for your door is to use a ring made of florist’s foam as the base. This annoys me, as I’m a traditionalist, make-it-from-scratch kind of person. In my ideal world, all the raw materials for such decorations would be available in my garden, or in that of a friend, or by foraging in a wood. Of course, manmade stuff such as wire and ribbons is fine for frameworks and trimmings (and can be re-used again and again) — but floral foam is a single-use petroleum-based substance, a completely unrecyclable affront to the planet. But, let’s take the creation above: see how the sprigs (of Dodonaea, or purple hop bush) flow around so gracefully? Well, if you had to affix each one individually to a wire frame, or stick them into a moss-filled donut (as used in the better British gardening magazines), you’d be days trying to get such an agreeable effect. But with your floral foam base (soaked first in a basin of water), you can just shove the bunches of leaves into the material. And, aside from the odd waif and stray that tumbles out on a windy day, they stay put. Fill in the outside perimeter of the ring first with sprigs of foliage, then the inner wall, and lastly, the face. In the wreath above I also added willow (an orangey-stemmed Salix alba), birch (brushed with leftover magnolia emulsion paint), skimmia berries and silver-sprayed lily seedpods. You can also make a twiggy ring from willow (as below), or from dogwood, birch or other pliable stems, and use that as your base. 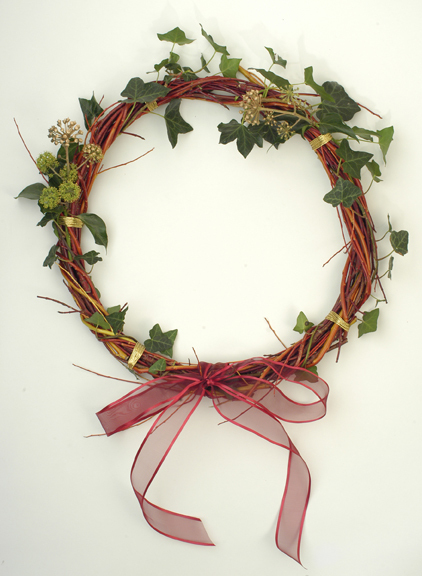 Tie or weave in lengths of ivy, bunches of berries, dried hydrangea flowers, or whatever you’re having yourself. Skimmia berries are excellent fodder for Christmas wreaths and garlands: birds don’t eat them, so you can be sure of finding some on shrubs in December. You may need to wire two or three bunches together to make a cluster large enough to make an impression. 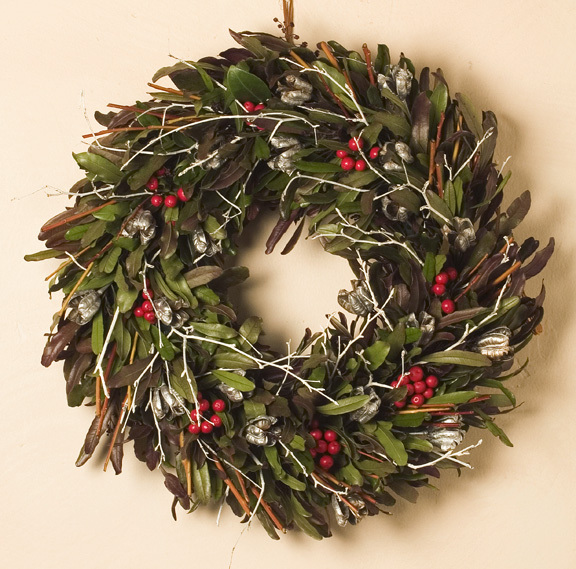 If you don’t have a skimmia bush (and we got rid of ours shortly after I made the above wreath), you can buy hypericum berries from a florist, or use any bright berry or fruit. Christmas wreaths need a touch of gaudiness to bring cheer to this dark season, so don’t try to be too sophisticated and monochromatic. Our trusty tin of magnolia paint was wheeled out again for the birch twigs here, and for the ears of wheat — which I’d grown during the summer. Oh, look! It’s the painted birch again — but really, the pale, wispiness does help to lift the whole thing. Chillies offer up spots of red, while gold and silver love-in-a-mist (Nigella damescena) provide the glitzy bits. Our old friend the Dodonaea is making its final appearance (the wind uprooted it a few months later), and the fine froth of green foliage spiralling around the edge is a very rare (at least in Ireland and Britain) tree: Casuarina cunninghamiana. It’s dead too: killed by the Big Freeze of 2010. Its wood, however, is now nicely seasoned, and has been burning steadily in the stove behind me as I write this post. Hope you have a very Happy Christmas and many thanks for keeping us entertained with your writings which I enjoy very much. Inspirational. There are lots of bits in the garden that can be used and they recycled. I bought a good natural base of twigs years ago (now in the attic) and I should get it out and dress it up. The wind often puts paid to using the south facing front door as a bakdrop here. Looking forward to your articles in 2012 – Happy Christmas. As good as I have seen this year. Gorgeous. Happy Christmas. They are lovely! Ours tend to be of the twiggy verity, a task delegated to one of the girls these days. Like the snow too. Lovely ideas Jane. 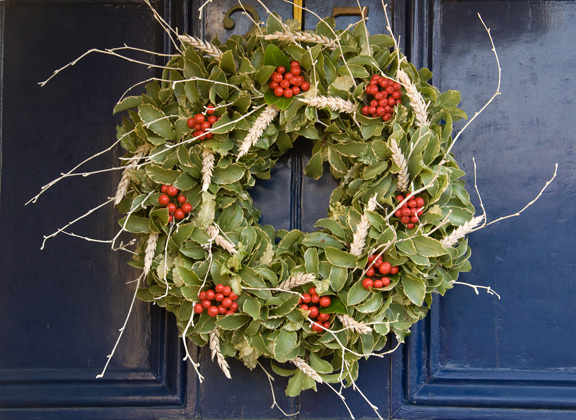 I have a day off tomorrow so a foraging expedition for wreaths is on the cards. I would like to take this opportunity to wish you and your family a really happy Christmas and a prosperous (for us all in Ireland!!!) New Year. I miss your contribution in The Irish Times but am enjoying your most recent book. One day I will have to give this a whirl. It seems to be a no fail project but who knows. I’m not that crafty! You are currently reading Some Seasonal Twiggery Pokery, and Ghosts of Christmas Wreaths Past at One Bean Row.